AMAZINGLY a motorcyclist survived being knocked out after hitting a pigeon at 50mph, which caused him to accelerate to 140mph whilst unconscious. Matthew Brealy, 38, collapsed on his Suzuki GSX-R1000 after the low-flying pigeon smashed through his helmet visor, leaving him unconscious but resulting in him opening the throttle - accelerating from 50 to 140mph. After impact he remained on the bike and continued for a further 200 yards before the bike ploughed into an oak tree. Mr Brealy, from Whittington Moor in Chesterfield, suffered two skull fractures with bleeding to his brain, a broken leg, cracked ribs and a fractured hand in the crash. He spent ten weeks in Sheffield's Northern General hospital following the accident in April, where his hand was re-wired and a titanium rod inserted in his leg. He is now learning to walk again with help from his pregnant wife Emma. Describing the incident to the Daily Mail, Matthew said: "It smashed through my helmet visor and even smashed the lens of my glasses, I was doing about 50 mph at the time and the impact knocked me unconscious. "It appears that I collapsed on the front of my bike and at the same time I hit the throttle so the bike just accelerated out of control. "Police told me afterwards they estimated that the bike had gone from 50 mph to around 140 mph in a matter of seconds but thankfully for me it happened on a straight road which is why I probably didn't fall off the machine. "My bike hit an oak tree with a glancing blow, I was thrown clear and the machine was smashed to pieces under the impact. 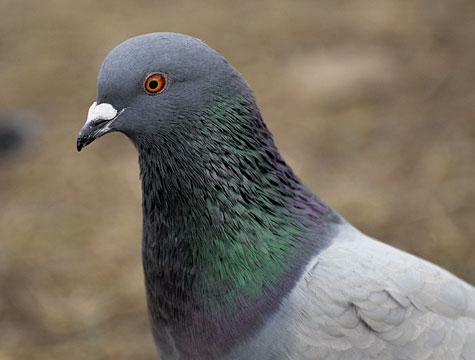 "Police confirmed a pigeon was the cause of the accident. My visor was left with a hole in it and I was covered in pigeon blood and feathers."